Kpreps.com is pleased to announce the finalists for the seventh annual Get Busy Livin’ – Kpreps Player of the Year Award in conjunction with the Dylan Meier Foundation. The 2017 award finalists include Jack Barger of De Soto, Milton Braasch of Shawnee Mission East, Dylan Freberg of Blue Valley North, Braden Howell of Bishop Carroll, Dalton Kuhn of Smith Center, Carter Putz of Bishop Miege, Cole Strickler of Pike Valley, and Dexton Swinehart of Lyndon. The award is in honor of Dylan Meier, a former All-State quarterback at Pittsburg High School and starter at Kansas State University who died in a hiking accident in 2010 at the age of 26. The annual award goes out to one Kansas high school senior who not only has shown excellence on the field but also has demonstrated the values that Dylan embodied and Get Busy Livin’ (GBL) strives to promote: adventure, fitness, curiosity and a daily zest for life experiences. 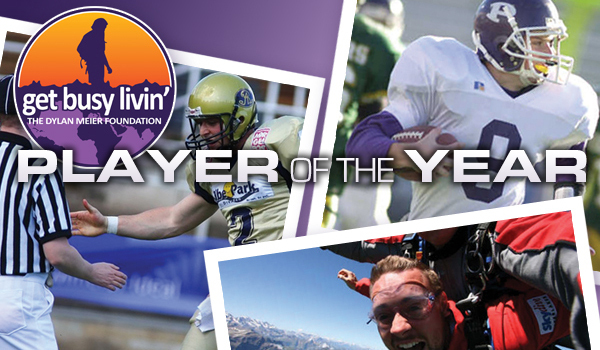 The award is made possible by The Dylan Meier Get Busy Livin’ Foundation and Kpreps.com. Here is a look at each of the finalists’ accomplishments on and off the field. Barger, an all-state outside linebacker for 11-2 De Soto, helped the Wildcats to a semifinal showing in Class 4A, Division I, the school’s best showing since 1989. Barger finished with 83 total tackles, 25 tackles for loss and six sacks and six fumble recoveries. Barger scored a 30 on his ACT, carries a 4.0 GPA, and signed at Emporia State to continue his football career. He helped De Soto enjoy a massive turnaround in his career. Even more than wins, coach Brian King stressed character when Barger and his teammates entered into high school. De Soto had posted an 0-9 record in 2013. “I am proud of how our season went, and I am thankful for all my coaches for demanding those 11 strong young men and living up to those ideals that they put out for us as a freshman,” Barger said. Barger achieved high honors in other activities, too. In piano, he picked up a Superior Rating by the Mid-America Music Association on four occasions and received media attention for his musical talents. He recorded a Superior Rating in state competition at the Kansas Junior Academy of Science. Barger has multiple leadership opportunities, including Principal’s Council and Principal’s Honor Roll, along with DHS Wildcat Band Leadership Team. Barger is a regular volunteer at the Church of the Resurrection West and taught Sunday school for the last five years. He often volunteers to play the piano for local retirement homes and has been a guest speaker for Starside Elementary Engineering and Career Day. Barger has worked as a volunteer official through the De Soto Rec League and a volunteer for De Soto Youth football and baseball camps. He has researched the GBL award and past winners for several years. “It really made me want to do and be something more than just a good athlete,” Barger said of the GBL honor. “Jack gives his whole self to whatever he does,” he added. “As you can see from the long list of ways he impacts our community you would have to assume he would be stretched thin. Instead Jack seems to thrive. One of the ways I appreciate most is his easy nature with young kids. Whether teaching kids about the love of Jesus or sharpening their skills on the court or in the science lab, his excitement and energy is infectious. An all-state selection and Colgate University signee, Braasch earned top-11 for all classes last fall. Additionally, Braasch is a two-time all-state lacrosse pick. Braasch was a semifinalist for the Simone Award, given to the best football player in the K.C. Metro Area. Dustin Delaney, who coached Braasch at Shawnee Mission East before moving to Colorado, labeled Braasch a “great young man.” Braasch led SME to a 9-2 record. He rushed for 1,646 yards and 27 touchdowns on 226 carries and earned Sunflower League MVP honors. Braasch took multiple unofficial visits to Ivy and Patriot League schools and was also offered by Air Force. “Winning the GBL award would mean so much to me,” Braasch said. “You can win all the football awards you want but eventually football will come to an end and you will have to succeed as a person not just as a football player. Winning this would be an honor and something I would treasure for the rest of my life. It is easy to want to excel as a football player, but not enough people want to excel as a person. This award would be something I would be proud to associate my name with and I would endorse it for the rest of my life. Braasch founded, managed and operates Lancer Lawn Service with two employees. He has consistently performed weekly lawn service for 20-plus clients from June 2016 to present. He has 30 volunteer hours with Harvesters from June 2017 to present. He has logged more than 130 volunteer hours on a full restoration of a 1977 Ford Bronco. This included a fully new fuel injection system, new brake lines, replacing the front body fenders and wet sanding the entire car. He served as a volunteer fifth grade flag football coach last summer. Freberg, one of the top targets for all-state quarterback and high-level Division I prospect Graham Mertz, helped Blue Valley North to the Class 6A title, the first in school history. A first team all-state player, Freberg recorded 1,525 career receiving yards with 14 career touchdown receptions. He had 220 receiving yards in the state finale. Blue Valley North went 1-26 in the three years before coach Andy Sims took over four seasons ago. “Once in a lifetime,” Freberg said of the title. Freberg said feels “very grateful” to be a finalist. Off the field, Freberg enjoys being a leader. He served as a captain for football and basketball. He is a National Honor Society member. A three-sport athlete, Freberg has priority walk-on status for the University of Kansas football team. He earned a Shrine Bowl nomination. “I truly believe that if Dylan is selected for this award that not only will he represent Kpreps and the Dylan Meier family proudly, but I also believe that this motivated and talented young man will serve as a standard of excellence for any future applicants,” Sims said. Howell, an all-state Top 11 player, led Bishop Carroll to the Class 5A state championship, the Golden Eagles’ first since 2014 and fourth in program annals. Howell led the classification in passing yards (3,086, 33 TDs) and helped the Eagles overcome multiple injuries. He often served as the top rusher and delivered 708 yards on the ground. The 5A Offensive Player of the Year, Howell earned a Shrine Bowl honor and was the Captain Chris Norgren winner. Carroll was picked third in the City League in the preseason, won the conference and finished 12-1. Howell will play for Missouri Western at the collegiate level. Howell has been involved with the Bishop Carroll Leadership Team the last two years. He has volunteered at youth sporting events and camps as a mentor and coach. Howell serves as an usher at his church on Sundays and volunteers with The Lord’s Diner, which helps feed the homeless in downtown Wichita. Howell helps his family take care of his elderly grandmother and babysits. His grandmother now lives with the Howell. “A big part of my life is being there for her,” Howell said. Howell has read Dylan Meier’s story and said, like Meier, that football “doesn’t define me.” Howell was impressed by Meier’s adventurous spirit and enjoys hunting, fishing, traveling and spending time with his family, experiences that have given him a “wider” life experience. Kuhn, the leader for the 2-1A state champion Redmen, delivered one of the most decorated seasons by any player in Kansas in 2017. He earned state Defensive Player of the Year honors by Sports in Kansas, the USA Today Kansas Defensive Player of the Year and top-11 all classes by multiple publications. Smith Center permitted just 78 points, easily the best in the state last year. He had 95 tackles, including a team-high 20 for loss. Kuhn, a lineman, received Division I interest, most notably by Kansas State, but signed with Fort Hays State, which had offered him last summer. Kuhn helped Smith Center finish 12-1 and win its ninth championship, and first in nine years. Kuhn was an all-state wrestler and virtually all of his senior season ranked first at 220 pounds in Class 3-2-1A. Kuhn had older Smith Center role models when he was young and has relished his role as he has grown up. “Growing up in Smith Center, it’s every kid’s dream to put on those Redmen jerseys,” Kuhn said. Kuhn assisted with football/wrestling athletics fund raising, helped local farmers tarp grain and silage piles, and moved elderly couples from home to home. He walked grade school kids to school as part of the “Walk & Run” mentor program, was a fourth-grade teacher aide/mentor and a four-year youth flag football coach. Kuhn has loved seeing the smile on kids’ faces when he helps. “Dalton has always had a lot of athletic ability,” coach Darren Sasse said. “What has been fun is watching him grow into a quality young man. As a senior this year he embraced leading our team in the weight room, in the locker room, at practice and on game night. He is involved in many things away from sports and has learned the value of giving back. Carter Putz, a Notre Dame baseball commit, completed his career as the most prolific passer in state history. The Eastern Kansas League Offensive Player of the Year, Putz set Kansas records for career completion rate (71.9), career passing yards (9,295) and touchdowns (124). He went 37-2 as a starter with three state titles. Miege won a state crown all four seasons of Putz’s career. This year, with an inexperienced receiving group, he completed 76 percent of his passes with a 38/5 TD/INT ratio en route to state Gatorade Player of the Year honors. Putz has a 4.1 GPA with 150 hours of community service. He works at Harvester’s, the Exceptionals and has volunteered for Miege football camps all four years. Strickler, one of the state’s top all-around players, twice earned all-state honors at linebacker. He led Pike Valley to back-to-back state semifinal showings, the best two-year run in Pike Valley annals. This fall, Strickler delivered 105 tackles and intercepted three passes with a pair of pick-sixes. Overall, he tallied 341 tackles and eight interceptions in his career. This year, he moved to tailback for part of the year after all-state running back Lane Peters suffered an injury. He delivered 25 touchdowns with 877 rushing and 513 receiving yards. He received significant interest from NAIA and Division II schools but plans to attend Kansas State and major in Chemical Engineering on academic scholarship. Strickler has served with NHS, KAYS, FBLA, tutored a local student, worked as a volunteer bible school worker, and been a volunteer coach for Empower Fitness. Additionally, Strickler has helped with clean up after a tornado, painting school bleachers and picking up road trash around Scandia, Kan. The most accomplished player in Lyndon history, Swinehart holds school records for career touchdowns, receptions, receiving yards and rushing yards. Overall, he cleared 1,000 rushing yards three straight years and finished with 4,056 rushing yards and 61 career rushing yards. He delivered 37 touchdowns on 166 offensive touches in 2017. Receiving-wise, he finished with 127 catches for 2,019 yards and 24 TDs. Swinehart collected first team all-state honors his last three seasons and delivered a 4.0 GPA. The 2-1A Offensive Player of the Year, Swinehart volunteers with youth, a member of the student leadership team and also part of FBLA. An Emporia State signee, Swinehart led Lyndon to a 9-2 record. In summer 2016, he went to Missouri for an event called Camp Mitiog (Made in the Image of God). This is a place to help young children ages eight to 17 who have Spina Bifida.